Yup, another notch in that race belt! 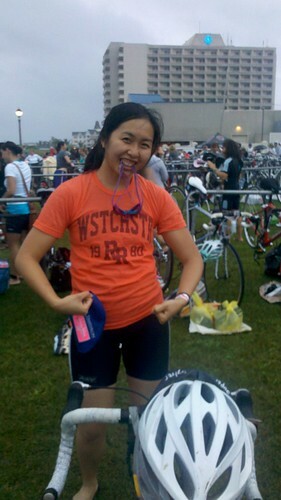 This past weekend, my friend Liz and I participated in the Jersey Girl Triathlon held in Long Branch, New Jersey. Every single triathlon I participate in, not only do I learn something about racing, but I always learn something new about myself as well. 1) Sometimes your biggest fears and the source of all of your self doubt come at you in the form of cold scary waves and high ocean swells of a storm churned ocean. As I waited for my wave to start, there was nothing I could do, but to stand on that beach and watch that ocean churn, along with my stomach and desire to run away. But, once the signal was given to start, there is nothing you can do but to run head on into the waves, tackling that all that self doubt along the way. 2) Breakfast can be drunk out of a repurposed Peanut Butter Jar. I carried the my Perpetuem Cafe Latte powder in the jar from home. When I woke up that morning, I poured some water in, shook it up, and voila! Cafe Latte, Hammer style! 3) Make sure my front wheel is properly seated before biking. I kept hearing my front wheel brushing up against my brake. But i didnt want to stop to fix it, so I kept on going, but the noise was getting louder, so I finally stopped, and as I went to adjust my bracket, the fork of my bike popped in properly into the bracket. Whoops! That would have otherwise been pretty embarrassing to lose a wheel! 4) Do my BRICKS! A quick 1 miler on the treadmill after a spin class is not a proper brick. Today, my legs punished me for it. One of my goals for these races is to place in the top 20 of my age group. I have a tough group, and next year I will enter the super competitive years of 30-50 year olds (they are tough!). I checked initial results at the race, and I placed 21st in my age group (25-29). So close! (final results place me 22nd…still close!) Maybe if I had properly done my Bricks, I would have kept that momentum I had from the bike and not burned out on that run. Post tri and post cleanup shower, we were famished. Just our luck, Bobby Flay’s Burger Palace was right down the road! Mmmm burger, this is going to taste so good! I had the Napa Burger (left), which came with goat cheese and watercress, while Liz got the Carolina Burger with cheese and a cabbage slaw in a mustard vinaigrette (right)? I wasn’t sure if that was the exact description, but she said it was good! Mine was awesome. I ordered it medium, and it came medium. 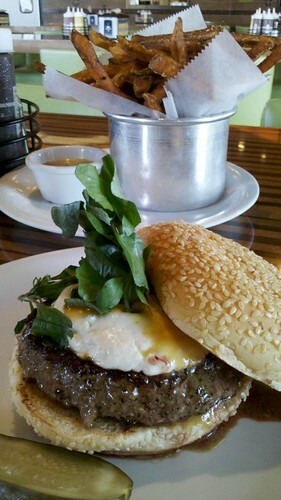 It was juicy, and the goat cheese was goat-y and there was so much of it, it dripped out of my burger. The bun was toasted perfectly and the ratio of bun to burger was perfect (bottom bun held up beautifully against the juice of the burger without being too much bun). We also got Sweet Potato fries to share, and yes, they too were delicious (or I was just that hungry!). Now let’s fast forward a day…. 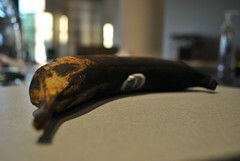 Today, I came home to find my plantain ripe and ready to rock. So, I whipped up one of my favorite quickie desserts. Nothing fancy, and not really like the real thing, but close enough. I love going to Latin American restaurants for one thing (on top of the other delicious foods they also have), maduros, or sweet fried plantains. 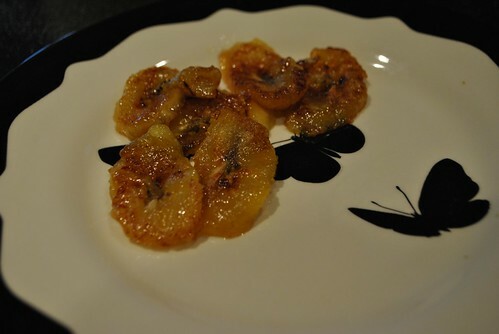 I love them as a side dish, and I will gladly eat it as dessert. I can eat them everywhere! 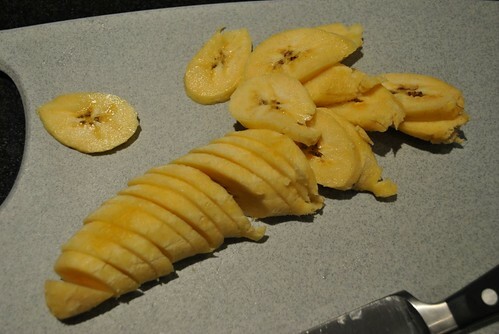 To start, I took my super ripe plantain (black skin) and sliced it up. Technically they should be sliced in about one inch chunks on a bias, but for whatever reason, tonight I sliced them into thin slices. 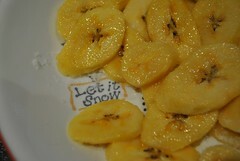 Then I took those slices and tossed them in a little sugar. Seriously, I don’t know what’s going on with me tonight, as I doused mine in sugar, but be stingy with the sugar. The plantains themselves are already really sweet. Then pour some oil into a pan. Vegetable oil or any other frying oil would be perfect. 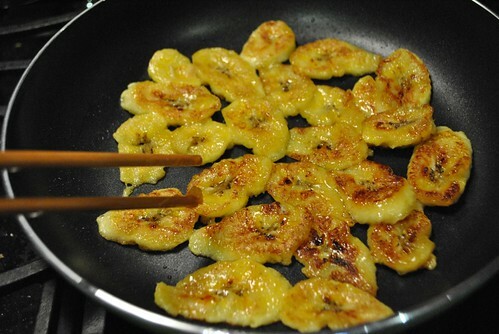 Get it nice and hot, then carefully put your plantains in. Fry up until both sides are caramelized and golden brown. Then take them out and enjoy! As always, more pics can be found HERE! 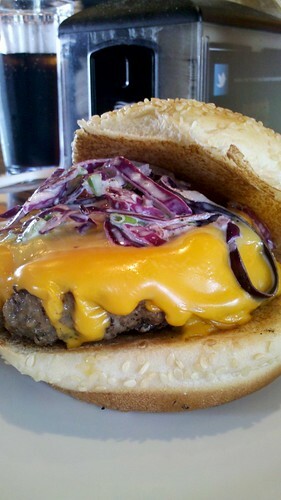 That Carolina burger with the slaw is making my mouth water. Can I have a burger for breakfast?